What To Do After A Fresh Ubuntu 10.10 Install? Run These Commands! In case you were wondering, there won't be a new Ubuntu Start script version, at least not for Ubuntu 10.10. There are many reasons for this but I'd rather not get into details. To get you started with your fresh Ubuntu 10.10 Maverick Meerkat installation, I'd though I'd share the commands I use to install the basic stuff. For everything else there's Ubuntu Tweak or manual installation, however these following should get you started. Important: before running the commands below, you need to enable the restricted, multiverse and partner repositories. To do this, open the Ubuntu Software Center, select Edit > Software Sources, and on the first tab (Ubuntu Software), check all the repositories. Then switch to the second tab (Other Software) and check the "Canonical Partners" repository. 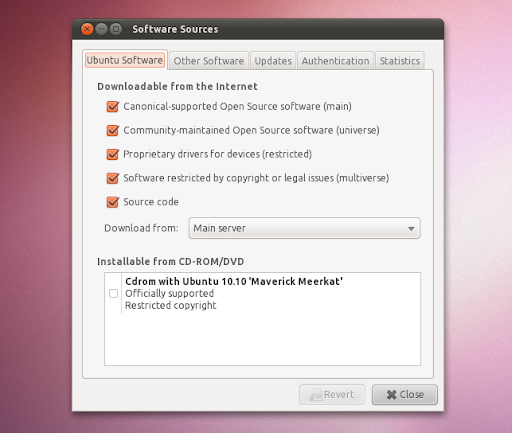 Disclaimer / notes: Like I said, this is just the basic stuff to install after a fresh Ubuntu 10.10 Maverick Meerkat installation and it includes a lot of non-free / restricted applications as well as some very popular non-default applications. If you'd find some applications which you've never heard of, it wouldn't be a "what to do immediately after installing ubuntu" post anymore but a regular post about new applications with a catchy title. Also, if I'd write about each and every application I use, it would probably be useless because not everybody uses what I like - instead simply browse around WebUpd8 for that. So this is a simple post about getting you started with a fresh Ubuntu 10.10 installation. For a complete Ubuntu, you could use Linux Mint, Manhattan OS, Pinguy OS or mFatOS - everything installed by default - less hassle. But let's hear it from you. What do you install or tweak after a new Ubuntu installation (or upgrade)?